To all of you who stop by my blog for a visit, this card is for you! Think of it as a virtual card from me to you. I truly enjoy sharing my work here with you, and hope you leave with some inspiration each day. 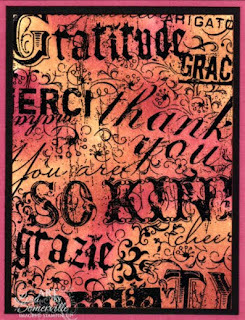 I created this card using the Burnished Backgrounds Technique from the October TJNL, using the Gratuitous Graffiti stamp from Stampin' Up!. If your not familiar with The Technique Junkies Newsletter, click here for more information, 99% of all techniques I use on my cards come from the Newsletter or CD, it's a wonderful stamping resource. Speaking of the CD, did you know CD7 is already being shipped! These make great stocking stuffers for the crafter on your list. Great card, can't wait to try that tech. TU for sharing every day!